Political leader. Mahmoud Ahmadinejad was born Mahmoud Saborjhian on October 28, 1956, in the village of Aradan, near Garmsar, in north-central Iran, 82 miles southeast of Tehran. Mahmoud was the fourth of seven children whose father was a blacksmith. In 1957, the family moved from Aradan to the Narmak district of Tehran in search of better economic conditions. During this time, his father, Ahmad, changed the family name from Saborjhian (which translates to “thread painter,” the lowliest job in Iran’s traditional carpet-weaving industry), to the more religious Ahmadinejad (“race of Muhammad” or “virtuous race”). Mahmoud Ahmadinejad grew up in an Iran dominated by Western influence. Three years before he was born, the U.S. CIA aided in a coup to install the pro-Western Shah Mohammed Reza Pahlavi as head of state. Many Iranians, led by the country’s Islamic clerics, resented the Western incursion into Iran’s politics. Ahmadinejad held no interest in politics as a young boy. He went to primary and high school in Tehran, and excelled in his studies. He received high marks on the national university entrance exams, finishing 130th out of 400,000 students. He entered Iran University of Science and Technology in 1975 and received his undergraduate degree in civil engineering in 1979. It wasn’t until he attended Iran University that Ahmadinejad became politically active. Though the Shah’s regime repressed all political activism and descent, Ahmadinejad secretly produced and distributed an anti-Shah propaganda magazine called Jiq va Dad (Scream and Shout). He joined the Islamic Association of Students in the Science and Technology University, a faction of the Office for Strengthening Unity between Universities and Theological Seminaries. The latter organization allegedly planned the taking of hostages from the U.S. Embassy during the 1979 revolution against the Shah. 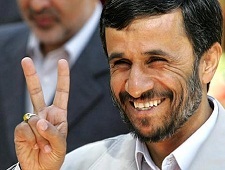 It is unclear whether Mahmoud Ahmadinejad participated in the takeover of the embassy. Some of the former hostages have identified him as one of the student leaders involved in holding 52 embassy employees for 444 days between 1979 and 1981. Ahmadinejad denies this, as do several of his political opponents who were involved in the embassy take over.